February 23, 1685 OS (March 5, 1685 NS), Halle, Germany, 5:45 AM, LMT. (Source: rectification by Kraum in AFA, July 7, 1685. Some confusion may exist among sources between the Old Style and New Style calendars) Died, April 15, 1759, London, England. Handel does, of course, have the seventh ray in abundance as well as the fourth. His powerful Sun/Moon conjunction in sixth ray Pisces and his elevated sixth ray Mars in sixth ray Sagittarius, greatly reinforce the presence of the sixth ray in his energy system. It is for his sacred music—his oratorios, such as The Messiah, that he is best loved and remembered. One can only say of this religious music that is it sublime. He touched the higher worlds and evoked angelic blessing. The influence of the Aquarian Ascendant with Venus and Mercury on either side, can be understood as a harmonizing and ‘angelicizing’ of the etheric body, as a service to the world. The music of Handel purifies and re-orders the ethers. The Messiah was written in twenty one days; for those who wonder what “channeling” really is, they should attend to this example—one of the purest. “Whether I was in my body or out of my body as I wrote it I know not. God knows." "Milord, I should be sorry if I only entertained them. I wished to make them better. " The famous composer Handel was born at Halle in Saxony in 1685, son of Georg and Dorothea, and died in London in 1759. He worked first at the opera house in Hamburg and spent several years in Italy before making his first visit to London in 1710. By 1717 he had settled permanently in England and in February 1727 was naturalized as an Englishman by Act of Parliament. Handel made his reputation as a composer of Italian opera for the London stage, but like most composers of the period, he wrote music for a wide range of occasions and patrons. Some of his earliest works setting English words - a birthday ode for the Queen and a Te Deum and Jubilate in celebration of the Treaty of Utrecht – were performed before Queen Anne in 1713. The accession of George I caused Handel some embarrassment, however, for he had previously been employed by the new king in Germany (where George was Elector of Hanover) and had broken his terms of employment by remaining in England. Fortunately, the new monarch forgave Handel this misdemeanour and the composer enjoyed much royal patronage for the remainder of his life. The works that associate Handel most closely with Westminster Abbey are the four anthems written for the coronation of George II in 1727. The best known, ‘Zadok the Priest’, has been used at every coronation since then, but all four continue to be regularly performed and recorded. Handel also wrote an anthem, ‘The ways of Zion do mourn’, for the funeral of Queen Caroline (George II’s consort) who was buried in the Abbey in December 1737. A less well-known link between Handel and the Abbey involves Esther, the composer’s first oratorio, performed privately at the Crown and Anchor Tavern in the Strand in 1732 under the direction of Bernard Gates. Gates was Master of the Children of the Chapel Royal, but he was also a long-standing member of the Abbey’s choir and had assembled a number of his Westminster colleagues to sing in the chorus. Three days before his death in 1759 Handel signed a codicil to his will saying he hoped he might be buried in the Abbey and desired that his executor erect a monument for him. The funeral was attended by about 3,000 people and the choirs of the Abbey, St Paul’s Cathedral and the Chapel Royal sang the service. His gravestone in the south transept reads “GEORGE FREDERIC HANDEL BORN YE 23 FEBRUARY 1684 DIED YE 14 OF APRIL 1759”. The date of his birth inscribed on the stone is not a mistake but is due to the fact that the new year in England at this period did not begin on 1 January but on 25 March (Lady Day). Therefore, to the contemporary Englishman, Handel was born in February 1684, as the year 1685 would not have begun until 25 March. The coat of arms on his gravestone is now very worn. On the wall above his grave is a fine monument by the sculptor Louis Francois Roubiliac (with the same inscription as on the stone but with the dates in Roman numerals). The life-size statue, unveiled in 1762, is said to be an exact likeness as the face was modelled from a death mask. Behind the figure, among clouds, is an organ with an angel playing a harp. On the left of the statue is a group of musical instruments and an open score of his most well-known oratorio Messiah, composed in 1741. Directly in front of him is the musical score I know that my Redeemer liveth. Above the monument a small additional tablet records the Handel festival or ‘Commemoration’ of 1784. This series of concerts of Handel’s music was given in the Abbey by vast numbers of singers and instrumentalists and established a fashion for large-scale performances of Handel’s choral works throughout the nineteenth century and much of the twentieth. George Frideric Handel (German Georg Friedrich Händel), (February 23, 1685 – April 14, 1759) was a German Baroque music composer who lived much of his life in England, a leading composer of concerti grossi, operas and oratorios. His best-known works are Water Music, Music for the Royal Fireworks and especially Messiah, an oratorio set to texts from the King James Bible. He was also deeply influential on many composers after him, including Haydn, Mozart, and Beethoven. Handel was born at Halle in Saxony. He displayed considerable musical talent at an early age, by the age of seven he was a skilful performer on the harpsichord and organ, and at nine he began to compose music. However his father, a barber-surgeon to the court of Saxe-Weissenfels, opposed George Frideric pursuing a musical career, preferring him to study law. Nevertheless, the young Handel was permitted to take lessons in musical composition and keyboard techniques from Friedrich Wilhelm Zachau, the organist of Liebfrauenkirche, Halle. In 1702, in obedience to his father's wishes, he began the study of law at the University of Halle, but after his father's death the following year, he abandoned law for music, becoming the organist at the Calvinist Cathedral. The following year he moved to Hamburg, accepting a position as violinist in the orchestra of the opera-house at Hamburg. Here his first two operas, Almira and Nero, were produced early in 1705. Two other early operas, Daphne and Florindo, were produced at Hamburg in 1708. During the years 1707-1709 Handel travelled and studied in Italy. 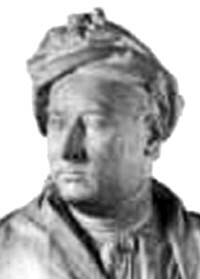 His Rodrigo was produced at Florence in 1707, and his Agrippina at Venice in 1708. Two oratorios, La Resurrezione and Il Trionfo del Tempo, were produced at Rome in 1709 and 1710, respectively. In 1710 Handel became Kapellmeister to George, Elector of Hanover, who would soon be George I of Great Britain. He visited London in 1710 and settled there permanently in 1712, receiving a yearly income of £200 from Queen Anne. In 1726 Handel's opera Scipio (Scipione) was performed for the first time, the march from which remains the regimental slow march of the British Grenadier Guards. He was naturalised a British subject in the same year. In 1727 Handel was commissioned to write four anthems for the coronation ceremony of King George II. One of these, Zadok the Priest, has been played at every coronation ceremony since. Handel was director of the Royal Academy of Music 1720-1728, and a partner of J. J. Heidegger in the management of the King's Theatre 1729-1734. Handel also had a long association with the Royal Opera House at Covent Garden, where many of his Italian operas were premiered. Handel gave up operatic management entirely in 1740, after he had lost a fortune in the business. In 1751 he became blind, and died some eight years later in London. He was buried in Westminster Abbey. Handel adopted the spelling "George Frideric Handel" on his naturalization as a British citizen. His name is spelled "Händel" in Germany and elsewhere, and "Haendel" in France, which causes no small grief to cataloguers everywhere. There was another composer with a similar name, Handl, who was a Slovenian (without umlaut; so not Händel). He was usually known as Jacobus Gallus. 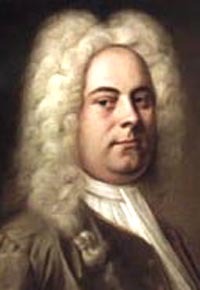 Handel's works were edited by S. Arnold (40 vols., London, 1786), and by F. Chrysander, for the German Händel-Gesellschaft (100 vols., Leipzig, 1859-1894). Handel lived at 25 Brook Street, London from 1723 until his death in 1759. It was here that he composed Messiah, Zadok the Priest, and Fireworks Music. Brief biography: George Frederic Handel was born on February 23, 1685 in Halle, Germany. His father was a barber surgeon that discouraged Handel's music interest while his mother supported him. Handel tried the local university unsuccessfully and dropped out after one year. He then left home and went to Hamburg. There he conducted at opera houses and quickly became the second violinist in the orchestra. Exposed to the Italian operatic style, Handel learned all that he could and applied it to his first opera, Almira, which he wrote at age 20. After his brief stay in Hamburg, Handel moved on to Italy and stayed there for the next few years composing operas and oratorios. When Handel left Italy he carried with him the reputation of a composer. Handel's next move was to England, where he eventually settled. There he was appointed one of the musical directors of the Royal Academy of Music. In England, Handel wrote many English operas including Julius Caesar. After the success of John Gay's The Beggar's Opera that closed the Royal Academy, Handel focused his attention on writing oratorios again. His Israel in Egypt, Messiah, Judas Maccabaeus, and Jephtha were some of his best works that were well received in that time. Eventually Handel suffered from cataracts that lead to blindness and suffered from a series of paralytic strokes. 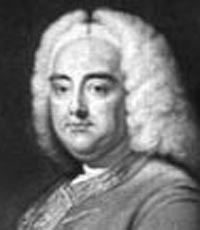 Handel later died in London, England on April 14, 1759 and was buried in Westminster Abbey. One London papers wrote: "Last night about Eight O' clock the remains of the late great Mr. Handel were deposited...in Westminster Abbey...There was almost the greatest Concourse of People of all Ranks ever seen upon such, or indeed upon any other Occasion." Handel was a truly well known and liked composer of his time. Handel wrote his music within the Baroque era. He used diatonic harmony with expressive melodies and tone color for atmosphere and dramatic expression. His operas were based on heroes and adventurers and his oratorios were choral dramas using the Old Testament. Handel also produced instrumental works such as his Water Music and Music for the Royal Fireworks.